When you move your cursor over a monster the icon will change into a Sword. When you Left-Click ona nearby monster you will enter Battle Mode. You also can join a battle with a monster that is already in battle with another player if you belong to the same Guild or Nation as that player or are friend. If the monster is already in battle with another player, you will also see the option to 'Observe' which will allow you to watch the battle without participating in it. The color of Monster's Name is based on the level difference between your character and the monster. If the monster is 10 or more level below your character's level, its name will be Dark Blue. If the monster is 7 or more levels below your character's level, its name will be Light Blube. If the monster is close to your character's level its name will be White. If a monster is 4 or more levels above your character's level, its name will be Orange. If a monster is 7 or more levels above your character's level, its name will be Dark Orange. If a monster is 10 or more levels above your character's level, its name will be Red. In order for a mercenary to perform an action during your turn in Battle Mode they will need at least 100 Action Power. Mercenaries that are available to perform an Action during your turn will be highlighted in Green. After all mercenaries with enough action power have used an action during your turn or when the Time limit is up (30 seconds), it will be the enemy's turn. 1. Attack (A): Attacks an enemy with a basic attack. 2. Search (S): Search a dead enemy's body for items. 3. Move (D): Changes the location of selected mercenary in the Battle Formation. 4. Wait (F): The selected mercenary will standby without making any action for the current turn; however this reduces the number of active turns without allowing another mercenary to act as with the Guard command. 5. Defense (G): Tries to reduce damage by defending against the enemies attack during the enemy force's next turn. Using this command allows another mercenary to act if they have enough Action Power to do so. 6. Magic (Q,W,E,R,T): Uses a mercenary's Magic Skill. At first mercenaries are only able to learn two magic skills through the use of 'Skill Books', however as they advance in upgrades the amount of skills they can learn increases to a maximum of five. 7. Camera Effects (Z): This toggles the Camera Effects. When an attack is made, the camera will move to show more realistic angles of the attack. 8. Skip Turn (~): End your current turn saving your existing Action Power for the next turn: the enemy will have their turns. 9. Retreat: Withdraw from a battle, though there are still penalties you will be able to live to fight again usually without having moved. Retreating in Shadow Dungeons however results in your spawning outside that area. 10. Auto-Battle: If you have used an Auto-Battle License then you can choose to allow a battle to happen automatically. You will still need to fight manual battles to have enough Auto Battle points to continue using it once all your Auto Battle Points are gone. You will earn five Auto Battle points per successful manual battle and can store up to 20 points. A party is where two or three players 'team up' to fight against a common opponent. 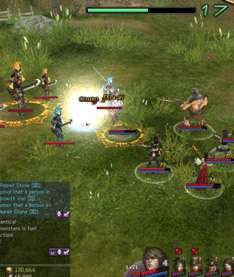 If the members of a party are close by then when one of the group is attacked or attacks a monster all members of that part will join the battle. Party play can significantly increase your chances of survival and ensures that all mercenaries get an equal share of the experience at the end of a battle. It is also possible to form a party with players who are not nearby; this is most commonly known as a Long Distance Party. Every battle participated in by any member of that party will be rewarded a fixed amount of experience based on level. Normally the lowest level mercenaries in each party member's formation will be awarded the most experience and a number of experience books will be awarded to all party members depending on the contribution of each battle. When a player you want to invite is nearby, Right-Click on them and then select Party from the menu. If a player you want to invite is not near you then you can Whisper them and select Party from within the Whisper Window menu. (In the Chat Box type '/t [Name] [message]' to whisper someone). You can also simply Right-Click on a persons name in the chat window and select the Party button. There are many benefits to being in a party, but you can only have a maximum of 3 members in a party. When you invite someone to join your party the default option set is 'Random'. The Party Leader may change this from the party window however to any of these three options. Individual: The character who searched the dead monster receives the items. Random: Randomly decides who will receive an item. Leader: All the items acquired will go to the Party Leader. 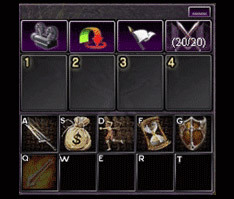 If the Party Leader's Inventory is full then the next Party Member will receive the items. Regardless of the party loot setting, all members in the party can receive quest items no matter who looted the monster. You can check the status of a party member, such as their Name, Level, and how much they have contributed to the party from the Party Window. 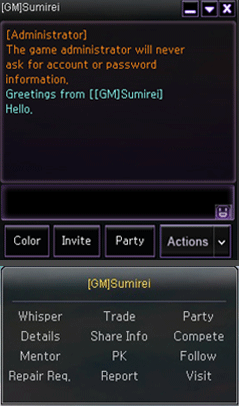 Whisper: Sends a private message to the selected Party Member. Follow: Move to and then follow a selected party member. Form Squad: Transform the Party into a Squad, allowing up to 30 people to join in individual parties for Squad Dungeons. Set Party Leader: Changes the party leader to the selected Party Member. Change: Change loot settings. By default loot is set to Random, but can be changed to either individual or Leader. 2 Members 50% Small Experience books or regular experience book* 3 times more likely to receive Material Boxes. * Book type and amount received is dependent on the amount of experience gained during battle. The values above only apply when two or more members of the party are battling together. In a Long Distance Party the benefits are far less but the additional experience can be useful when leveling up newer mercenaries. What is a Squad Party? A Squad Party is an enhanced party mode designed to host up to 30 players at a time and is divided into 10 teams of three. Despite this being the maximum, most Squad Dungeons have their own individual limits on the amount of players who can enter. The player who forms the Squad is appointed Commander. To create a Squad you must first create a Party then in the party menu select Create a Squad and accept the prompt when available. Squads Members have three different ranks each with different abilities. These ranks, denoted by color, consist of Commander (Gold), Assistant Commander (Yellow) and Squad member (White) each having access to a number of abilities. Commander: A commander can Invite and Expel members from the squad. They can also appoint an Assistant Commander or even name a new Commander. Commanders can also organize the squad as needed by being able to move members between any of the 10 teams and is the only person who can dissolve the squad. They also have access to basic commands such as withdrawing from the squad and distributing gold. Squad member: Squad Members are only allowed basic commands, which are withdrawing from the guild and distributing gold. 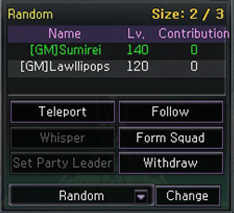 Most of these abilities function in the same manner as a normal party.Invite allows the commanders to add new members to the squad while Expel allows them to remove people from it, although using the Withdraw option they can remove themselves. If a Squad Commander withdraws from the squad then the first set Assistant Commander is promoted automatically. If there is no Assistant Commander then command goes to the longest serving Squad Member. If the squad ends up with only one person however it is immediately dissolved. 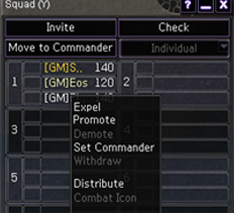 The Move Member ability used by the Commander and his Assistants isn't an actual button, but by clicking on the name of a member and then clicking an empty spot in one of the 10 parties. They can move that member to a different 'Party' within the squad or trade their place with another person. This allows squad members to party with others or freely fight on their own their own when inside dungeons. Distribute Gold is used to send your own Gold to other squad members equally which will be delivered to their mailbox. A small 1% fee is also taken from your on hand gold to send the mail. Finally there is one more command available to everyone. On the Squad Interface is a button titled Check. This is used to check the Combat Readiness of everyone in the squad by generating a small notice for Squad members to accept. The Free Leagues allow players to hone their combat skills competition with other players at similar divisions. There are six (6) competitions per day (every 3 hours) that lasts 55 minutes, and players can start registering 5 minutes before each competition begins, and still register up to 15 minutes before each competition ends. 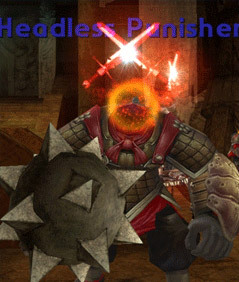 Each battle lasts a maximum of 10 minutes, after which if the battle is still in progress the player with the most earned Points will become the winner by default. Points are earned at a rate of 1 point per normal attack or 2 points per magic attack. 100 points are awarded for killing an opponent's mercenary. When a Free League starts at the designated hour, the system will automatically generate a match between players at a division between one higher and one lower your division rank. New matches between players are generated automatically every 11 minutes. 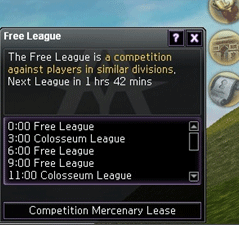 Each Free League will last for 55 minutes and if a player withdraws from the competition, that player will not be able to compete for the next 10 minutes. 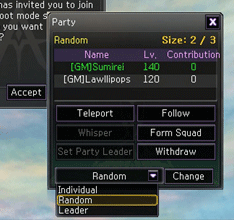 When you invite someone to join your party the default option set is 'Random'. The Party Leader may change this from the party window however to any of these three ptions. The rules for Colosseum League are essential the same as those for Free Leagues, with some important changes. - Players may register up to 10 minutes until the competition ends; 15 minutes for Free League. - Battles in Colosseum League lasts a maximum of 7 minutes instead of the usual 10. - New matches between players are generated every 8 minutes, instead of 11. Something particularly important to note with Colosseum League is that everything that the participant has equipped has no affect within battle. All stats and skill levels are preset regardless of level so everyone is entirely equal and the formation used plays a large part in battle. A "Proximo's Supply Box" item will be delivered to your mailbox for every 10 competitions you participate in. This box contains various items to aid your career in the Leagues. There are two types of special competitions that players are invited to participate in if they have the courage to do so. These are the Weekly Championship and Grand Championship. Both of these competitions are hosted every weekend and are much more rewarding than the usual Leagues. These championships are elimination tournaments, so if you lose even once, you're disqualified from the competition. The Weekly Championship is an elimination tournament hosted every Saturday at 3am and 3pm PST (PDT during Daylight Saving Time). This variety of tournament is to find the best of the best on the server which tends to bring the toughest opponents against each other with the full effects of their equipment applied, meaning strong is better, although strategy still plays a significant role. At the end of the Weekly Championship the Champion receives 15 Atlantis Platinum Coins plus 1 for each participant in the competition up to a maximum of 30 extra. The champion will also receive a rare mount known as Ghost Rider, which they may use freely for seven (7) days. Players may join to participate in the Weekly Championship up to 10 minutes before the competition begins. The Grand Championship is a massive elimination tournament hosted on the Titan Server. Titan is where all servers merge into one allowing for virtually everyone to participate in this battle of the ages to find the ultimate champion. This competition is hosted at 3am and 3pm PST (PDT during Daylight Saving Time) every Sunday. A small window announcing that the competition will soon begin will appear 20 minutes before matching, as well as giving players the opportunity to teleport to the Titan Server. Players can only apply to participate in the competition while at Titan and not from their normal servers. As with the Weekly Championship, the full effect of the participants gear is applied during these competitions, which really adds to the excitement of the matches. Strategy, tactics and even the mercenaries used to play a large role and can easily tip the scale of any battle. At the end of the Grand Championship the Grand Winner receives x30 Atlantis Platinum Coins, plus 1 for each participant in the competition up to a maximum of 30 extra. There is also a very special, and much improved mount given to the winner. The Barbarian Lord's Black Tiger, however this mount is also only available for seven days. Are you willing to put out a challenge and take on all players? Test your skills against opponents based on various options that you decide on. See just how tough you are with the Challenge system, which lets you battle with your friends or other players anytime you want, without having to wait around for a League to begin. Register a challenge and face whoever responds. Find and accept an open challenge. Just open the Challenge window under the Community tab in game to create a new challenge or accept a challenge hosted by another player. You can watch Challenge batles live by going to the Competition List. The tactical battle system is an all new system featured in Atlantica Online. Here are some basic guidelines to this system. TBS Missions can be entered either as a group in a Squad Party, or alone for Solo Mode, Solo Mode is specially adapted to reduce the stats of your opponents and has reduced fees for training; however the rewards are also lower compared to being in a squad party with other players. A squad is formed out of a party by right clicking on your party button and selecting squad. To find TBS mission visit Hissarlik Hill where various TBS NPC's can be found, all of these NPC's will have unique TBS missions suitable for different levels. When you enter a mission you will be able to select a number of mercenaries to join you depending on the requirements of the mission. In Solo mode you will typically be allowed to take more mercenaries into the dungeon than with a Squad. Victory in TBS will reward fearless warriors with items and experience to all of your mercenaries. TBS points are required to participate in TBS and reset every Thursday at 6:00 AM PST (Or PDT when in Daylight Savings). In addition to TBS missions there are also TBS Skirmish Dungeons. Skirmish dungeons can be entered individually or in a party. Unlike TBS missions, all of your mercenaries can be used and no TBS points are required to participate. Victory in TBS Skirmish Dungeons will provide better rewards and higher experience than regular battles, although with greater gains comes greater challenges as the monsters in Skirmish are much stronger than their counterparts. The Tactical Battle System can be experienced by selecting [TBS] from [Field Info]. A TBS section is also available to view in the in-game [Help] menu under [Game Info]. To use the TBS training ground, select NPC [Iolaus] near the entrace to the Sea Palace. The training ground can only be entered alone. Inside Iolaus will talk you through a basic tutorial on the Tactical Battle System including movement, attacking, training and more besides. To enter a TBS mission, the user must be in a squad (not required for Solo Mode) and have available TBS points. TBS points are reset every Thursday at 6:00 AM PST (PDT for daylight savings). A user can obtain more points by completing activities in the Atlantica Diary. To view your current TBS point status select [M Info] -> [Character Info] -> [Point Info]. To enter a TBS mission, speak to Primus, Medius, Terminus, or Latus on Hissarlik Hill. Each mission cost just 10 TBS points initially but repeating the same TBS mission will cost you an additional 5 points per attempt.